Do you know that Ethernet ports serve an important function in computers? Ethernet ports connect multiple computing systems through PC networks like the Ethernet LAN, Metropolitan Area Network, and Wide Area Network. This feature also allows the PC to link with the system mainframe. Thus, valuable data or information is directly stored in a centralised location. However, this port may experience connectivity issues due to wiring and structural damage. As a result, there can be a loss of internet and device connection. So, what are the common factors that can significantly affect an Ethernet port’s connectivity? Read more on this blog about the essentials of the Ethernet port and how to fix common connectivity issues. An Ethernet port enables the device to connect multiple computers as well as the internet. What’s more, device administrators can give commands and remotely operate the connected PCs. However, PC manufacturing errors, such as warped bezel ports, and unsecured Ethernet cards can result in network connectivity loss, which can lead to delayed operations. That is why PC users experiencing this issue are advised to check the Ethernet port or contact the product manufacturer’s technical support team for diagnosis. So, in the next section, learn how common Ethernet issues can be solved with these 3 definitive support guides. Lightning surges, transportation damage, and incompatible device drivers are amongst the common ethernet port issues. Get to know the reasons for these occurrences and how to fix it. Lightning surges are common occurrences during stormy seasons. The ensuing electrical current surge can overload unprotected electronics and damage the Ethernet port [In Compliance Mag]. Usually, a technical support specialist recommends contacting the device manufacturer’s representative to solve the issue. Also, installing a compatible surge protector with an Ethernet protection feature is recommended as well. This prevents excess electricity from damaging the PC cables and ports. Industrial PC Ethernet ports can sustain damages during transportation. Rough terrain and improper packaging can deform the port’s structure. As a result, the Ethernet cable does not fit the connector. For these instances, consult the manufacturer’s representative about the company’s RMA policy and ask for a replacement. Industrial PC experts always recommend updating the computing system with the latest version of drivers. An outdated Ethernet port driver can lead to system incompatibility which results in the loss of connectivity. So, make sure to upgrade the PC’s software as needed. A stable network and internet connection is crucial for an optimised operation. 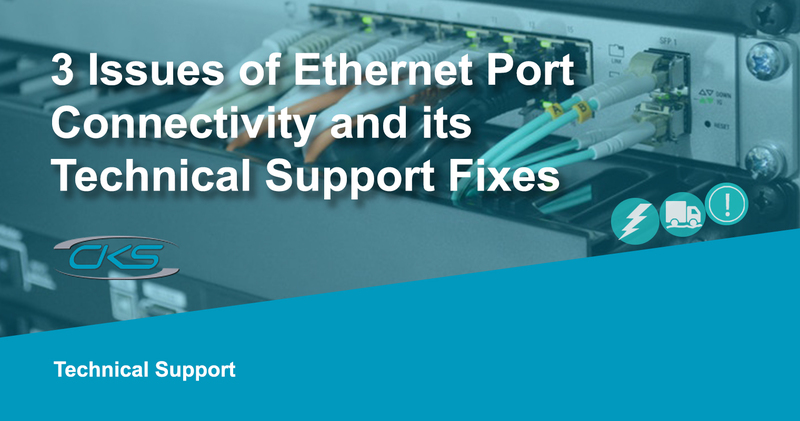 Issues like damaged Ethernet ports can affect this connection and reduce the overall operational efficiency. Contact an industrial computer manufacturer today and seek help from a technical support representative.